"Please Do Not Remove Label Under Penalty of Law"
When I read these warnings I get the urge to defy them. I want to mix chemicals just to see if they'll create poisonous gases or cause an explosion. I want to wander the aisles of a home textiles store and rip the tag off of every pillow. I've always been up for a challenge. I love defying the odds. I've never really set out to break the law, but I do think creatively. I visit a flea market, garage sale, or Goodwill store and my wheels spin into overdrive with the possibilities. 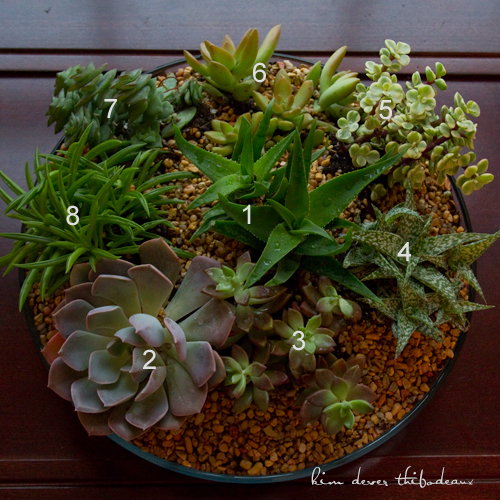 Recently, I decided that I wanted to plant a succulent dish garden. I've always appreciated the variety of textures and colors of these hardy, water-retaining plants that are cousins to cacti. Hmmm...water retaining...maybe I feel a kinship...Anyway, I decided to pick up a few little succulent gems at Home Depot. They had a modest selection and each plant cost a little under $4. But when it came to choosing a dish, I wasn't so lucky. I wasn't sure where my little garden would be placed so I wanted a neutral container...but I didn't want terra cotta. The other containers were too deep and they were plastic. Ewwww!!! I picked up a small bag of potting soil while I was there, which completed my purchases. Yes, I know, spending less than $50 at Home Depot sounds crazy, but I did it! I then headed next door to Walmart for a few groceries and decided to peruse the aisles for just the right dish. And lo and behold, I found it in the aisle with the party platters and serving trays. 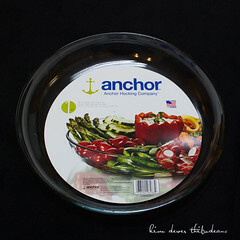 Anchor Hocking makes a 13", shallow glass dish, which they call a serving tray. It was just the right size. I know Anchor Hocking did not manufacture this dish with the intention of it being used as a table top garden. But I didn't see any warning labels on it telling me not to, so I went for it! 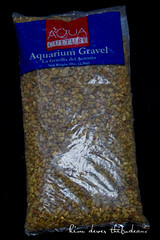 I already had bags of aquarium gravel at home, so I made my way to the checkout lanes. I often do things a little backwards, and this was no exception. After purchasing my plants, I did some Googling on how to plant them properly. I learned that I should have bought cactus mix potting soil or some pumice to add to my soil. 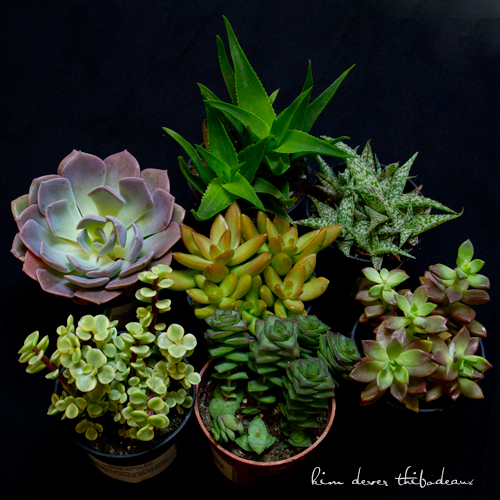 Succulents don't like wet feet, so you need to draw moisture away from them rather than hold it close. Good drainage is key. Sooo...Here's what I did. First I decided on how I wanted to arrange them in the dish. Then I poured a nice layer of gravel in my dish. Next, I poured a layer of potting soil. I removed each plant from its pot and positioned it in the soil. I sketched the arrangement on paper, numbered each plant, and noted the name by each. There's was no way I would remember what each one was. I wiggled each planting so that the roots were kind of in the gravel. I anchored the plants in place with more potting soil, then topped it with gravel to hide the soil. During the planting process, soil and gravel spilled into the leaves of the plants so I used an old paint brush to clean them off. I removed gravel from deep in the leaves using tweezers. I watered slightly and I was done. 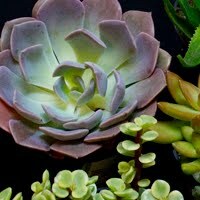 Succulents only need to be watered about once a week, and sparingly at that. Watering in the morning is best. They like morning light, so I placed my dish in the window of my bedroom. My original intention was to bring the dish garden to work, but from everything I read I don't think they would thrive. 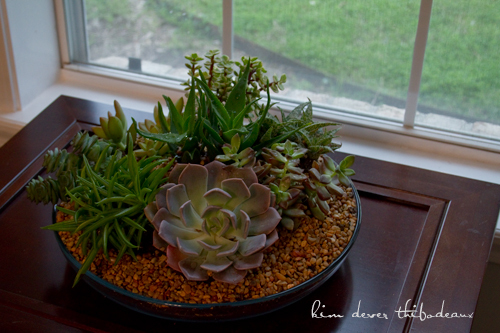 Here's my finished, succulent dish garden. I'm very happy with it. Here's an overhead shot and plant identification. Some have very cute names. 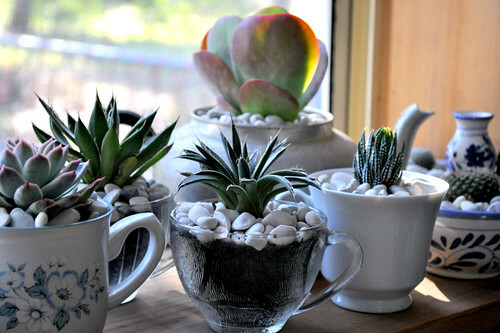 Succulents will grow in just about any kind of container, as long as they have good drainage. 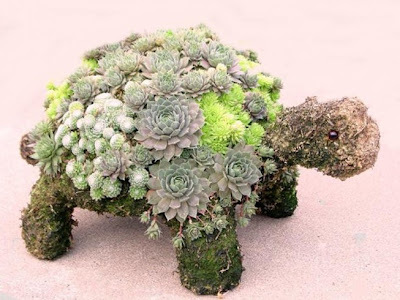 Here are some more clever ideas for growing your own. 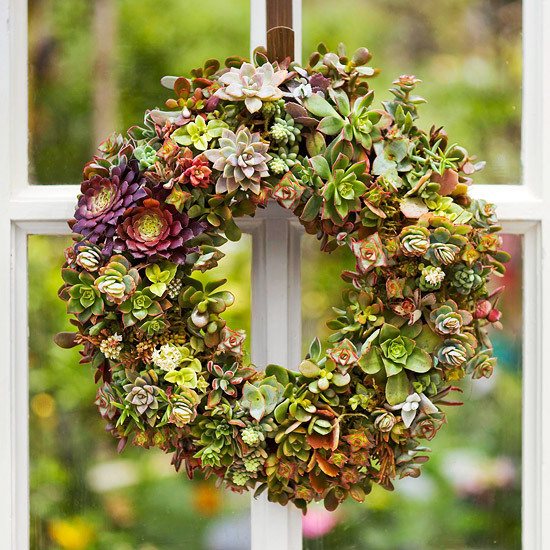 A living succulent wreath for year-round color by Julie Martens. Project instructions from Better Homes & Gardens. Do you enjoy hunting for tea cups at the flea market? You can use them to showcase succulents in a sunny window. 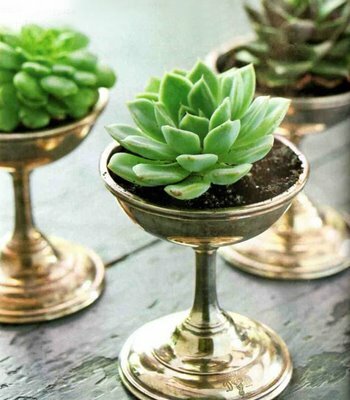 Barbara Jordan Dettweiler works succulents into her interior design in clever ways, like these vintage silver champagne glasses. You can read about it on her blog, Haus Design. Do you prefer glowing rather than growing? 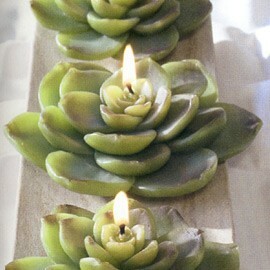 Here are some beautiful succulent candles from Tavalu.com. How about sewing instead of growing? 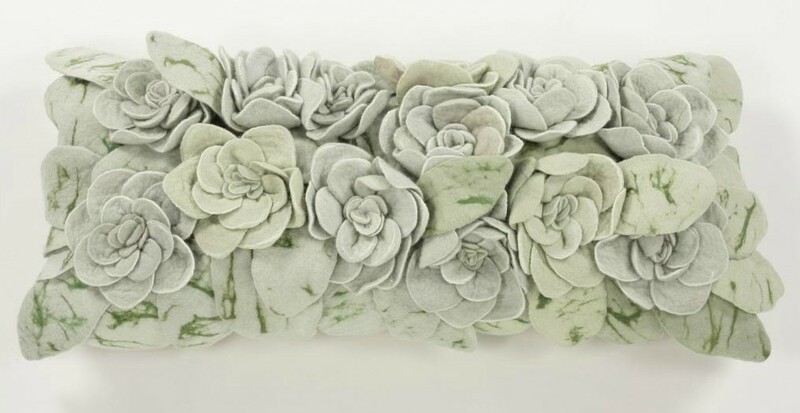 This cushion's design was inspired by the Euchavaria succulent. It's by Ronel Jordaan and can be found on amagugu.com. The simple elegance of succulents can be adapted to any decorating style and their drought tolerance means you don't have a green thumb to grow them. I'm sure you'll see them in future posts as I find new ways to work them into my own home. Want to see more great projects that you can do yourself? Join me at the Addicted 2 Decorating Link Party every Friday afternoon!